The Boulder County Commissioners and staff continue to advocate on behalf of Boulder County residents and local governments concerning oil and gas development in Colorado. The following activities are only the most recent to be undertaken by Boulder County. Please continue to view our oil and gas website for regular news and updates. SB 192 - Staff testified on March 15 in Senate Agriculture, Natural Resources, and Energy in opposition to SB 192 Local Government Liable Fracking Ban Oil and Gas Moratorium, which is the Senate version of HB 1150. The bill is up for action only (amendments and vote) on March 22. The bill would hold local governments financially liable to compensate for private mineral rights in jurisdictions where there are bans or other prohibitions on fracking and oil and gas development. 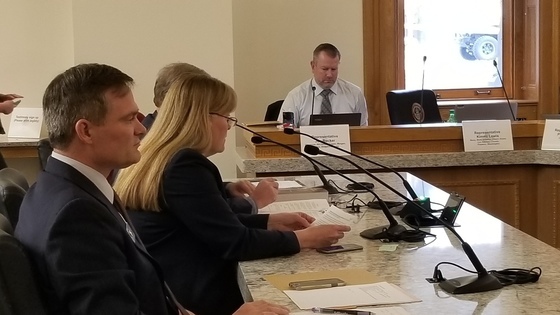 SB 063 - Boulder County Commissioner Cindy Domenico testified in Senate Agriculture, Natural Resources, and Energy, on Feb. 1 in support of SB 063 Oil Gas Higher Financial Assurance Reclamation Requirements. The bill was postponed indefinitely. The bill would have required financial assurance that operators can finance all foreseeable expenses related to regulatory compliance, such as adequately and safely abandoning wells and reclaiming lands, aligning requirements with those of hard rock mining operations. SB 048 - Boulder County Commissioner Elise Jones testified in Senate State Affairs on Jan. 29 in support of SB 048 Protect Act Local Government Authority Oil and Gas Facilities. The bill was postponed indefinitely. The bill would have allowed local governments to exercise their land use authority to regulate oil and gas development siting, including enacting moratoria and bans. HB 1157 - Commissioner Domenico testified on March 14 in support of Increased Reporting Oil and Gas Incidents (HB 1157). The bill passed House Transportation and Energy Committee and will move to Appropriations. The bill defines major and minor incidents such as spills, releases, accidents, etc. ; requires timeframes and content for reporting of incidents; and requires information to be made available to the public in an accessible, searchable way. HB 1289 - Commissioner Domenico testified on March 14 in support of Exempt Local Governments School Districts Forced Pooling (HB 1289). The bill was laid over to allow the sponsor to work on amendments. The bill would exempt local governments and school districts from being forced to develop their mineral rights in a forced pooling scheme. HB 1150 - Staff testified on March 7 in the House in opposition to HB 1150 Local Government Liable Fracking Ban Oil and Gas Moratorium. This bill and SB 192 are House and Senate versions, respectively, of the same bill. The bill would hold local governments financially liable to compensate for private mineral rights in jurisdictions where there are bans or other prohibitions on fracking and oil and gas development. HB 1071 - Commissioner Domenico testified on Feb. 1 in support of HB 1071 Regulate Oil Gas Operations Protect Public Safety. The bill passed out of the House. Commissioner Jones testified on March 7 in the Senate in support of the bill. This bill was postponed indefinitely in the Senate. The bill would have codified in statute language that when considering oil and gas development, the COGCC must prioritize public health, safety, and welfare, including protection of wildlife and the environment. Boulder County is concerned about the potential for significantly expanded oil and gas development in Boulder County and on county open space land. * We support appropriate tighter restrictions and increased local control to help mitigate the potentially hazardous impacts from these industrial activities. We pledge to continue to protect our local public health, safety, and the environment from the impacts of intensive oil and gas development using a multi-pronged approach of legislative, legal, environmental, and public health strategies. In 2017, Boulder County adopted the strongest set of regulations on oil and gas development in the State of Colorado. Read more on our Oil & Gas website. *Read the county’s Statement on Oil & Gas Development on Open Space. Read the latest news on oil and gas development in Boulder County. | Sign-up to receive updates via email or SMS text.